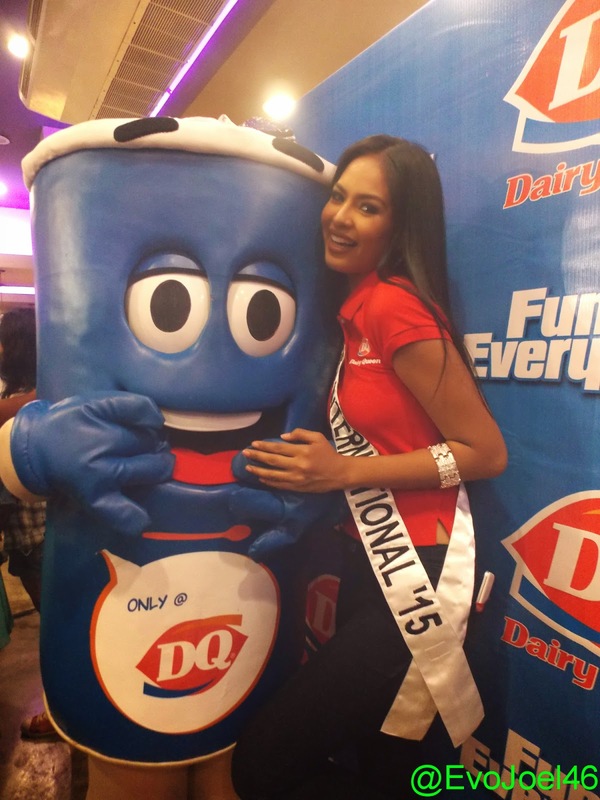 Evo & Grace: The WanderLusts: Binibini Queens 2015 endorses Dairy Queen. THE Worlds favorite ice cream, Dairy Queen introduced their newest endorsers for 2015, its no other than the reigning Queens of Binibining Pilipinas, Bb. Pilipinas-Universe Pia Wurtzbach, Bb.Pilipinas International Janicel Lubina, Bb.Pilipinas-Supranational Rogelie Catacutan, Bb.Pilipinas Intercontinental Christi Lynn McGarry, and Bb.Pilipinas Tourism Ann Lorraine Colis. Just like last year, DQ have three past Binibinis as their endorsers, but due to good feedback and positive response, they get the five winners of Binibini to represent their product, which is a hit especially this very hot summer. This five ladies is part of DQ's newest campaign, the Fun Every Dairy is the slogan that this titlist will shout out for a year, they will be given a chance each to do a TV Commercial of Dairy Queen that will be shown nationwide. Wurtzbach during the launching said, that being a student of culinary she really love the Blizzard of DQ, she know that it is worth tasting for, while the Cinderella of Palawan, Lubina said that it become a habit for her in eating ice cream especially during the competition proper, wherein DQ continuously supply some of their snacks during breaks. The Five Binibinis will also visit some of DQ's store in the country, so far they have around 77 store nationwide, and some charity event of DQ's. For more information visit www.dairyqueen.com.ph or like Dairy Queen Philippines Official Facebook page.